BACK ROW (from left): Ron Fell, Heber Smith, Mike Cleary. A promotional photograph of KNBR’s current cast of characters, 1973 edition. The photo was a handout made available through the local Rusty Scupper chain of restaurants (“Where the food is great, the drinks are big and the price is right”). 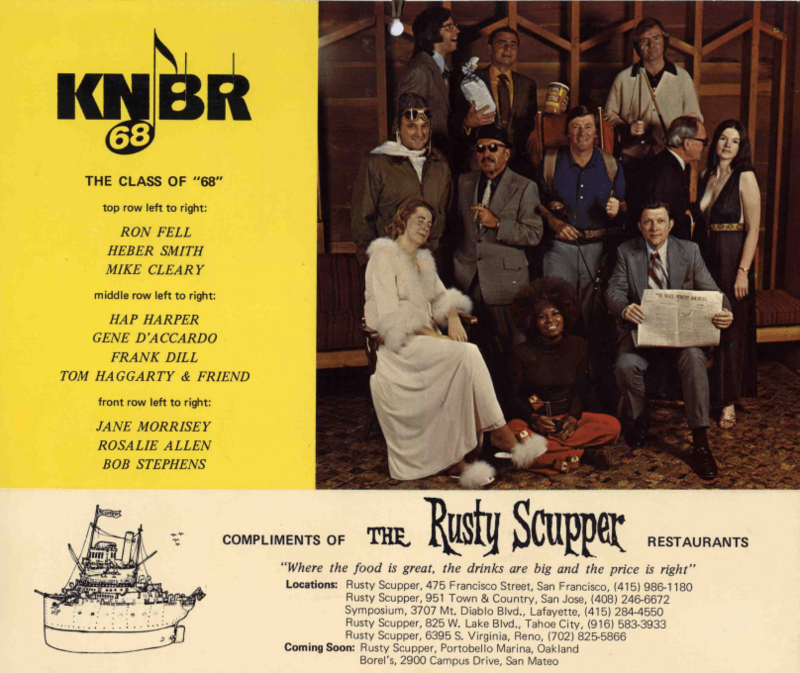 The photo was taken for the KNBR/Rusty Scupper 1973 calendar. Carter B. Smith was hired soon thereafter, I think. Tom Haggarty was a fictitious character voiced by Mike Cleary. As a matter of explanation, I had Mike participating on Frank’s show (6-10 am) each morning and Mike would often appear in the Tom Haggarty character. Frank would also almost always stick around after his shift was over and participate in Mike’s first hour (10am-11am). The reference to “The Class of 68” was not a reference to the year, but the dial position. And if you ever find a promo shot of the license plate “KNBR 68” that became a major ad campaign for the station, that was my personal plate. The campaign of billboards all over SF began in ’74 and I gave up the plates to the station when I left in ’75. A few months after I left, they put Frank and Mike together for four hours and that lasted for maybe a decade. I never thought four hours of the two of them would work, but I was wrong. I also never had the budget to even try it. I think Mike’s moving to morning drive opened up the midday slot for C.J. Bronson. Anyway, the guy playing Tom Haggarty in the calendar photo was actually Mike’s father. The woman was just a prop to support the gag. Bob Stephens was the stock market reporter on KNBR. Jane Morrison was the longtime Public Affairs director for KNBR, and she happened to be the wife of prominent San Francisco politician Jack Morrison (no joke).